Your better off going to any other cash advance than CashDisc.com. Watch and see for yourself. In 2009 Spring Day for Europe joins the European Year of Creativity and Innovation to encourage as many schools as possible to experience creativity and innovation on a European scale. Spring Day for Europe is an annual campaign that is open to all schools in Europe and elsewhere in the world. Teachers are encouraged to book one or many days in their calendar to involve their students in activities that focus on debate, interaction and reflection on European themes. Spring Day enables young citizens to express their views and make their voices heard in Europe. 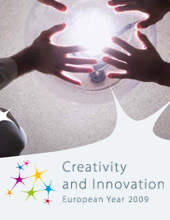 2009 is the European Year of Creativity and Innovation (EYCI). In its seventh year and because of its popularity, the Spring Day campaign is joining up with the Year and is expected to trigger interest in and raise awareness about creativity and innovation, in schools in all EU member states and beyond, as well as at local, regional and national level. The Spring Day for Europe campaign suits many of the school subjects and offers a set of teaching and learning opportunities in which teachers and students may experience both cultural and practical aspects of creativity and innovation. highlight regional and local strategies based on creativity and innovation. The Spring Day for Europe campaign also offers a number of opportunities to foster online and offline debates focusing on creativity and innovation, in the year when the EU citizens will again cast their votes for the European Parliament elections.In this context participants are also encouraged to reflect on the EU strategic orientation for the post-2010 decade and on the “knowledge-based” aspects of the Lisbon strategy. Spring Day for Europe runs this year from 25 March to 9 May 2009. Schools of all types are welcomed, from pre-primary to upper secondary and vocational schools. Spring Day is also open to classes from organisations responsible for extra-curricular activities whose goals are to develop and strengthen skills related to school curricula.